Write node -v on the command line. If that tells you the version, and it’s higher than 0.10.23, you’re good. Bear in mind that 0.11 versions will not work as they are beta releases! If you need to install nodejs, see here: downloads page on nodejs.org. Here’s the page to download it from: https://ghost.org/download/. 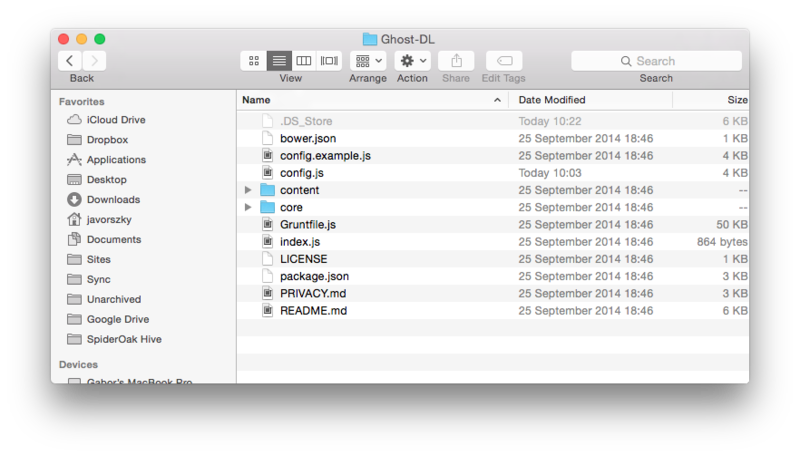 Create a folder for your Ghost files, and extract your files there. It should look like the picture below. I put mine in ~/Sites/Ghost-DL (short for DownLoad). It does not matter where you put the files. In terminal, cd into the folder, and run npm install --production. That will install all the necessary packages Ghost depends on. Run it with NODE_ENV=production npm start. The NODE_ENV is important. In your browser, go to http://localhost:2368/ghost. If you end up with http://localhost:2368/ghost/setup and a setup page, everything is fine. General usage of Ghost. What’s what, how does it work, let’s get familiar with it. What is this Markdown thing? Syntax, usage, etc.